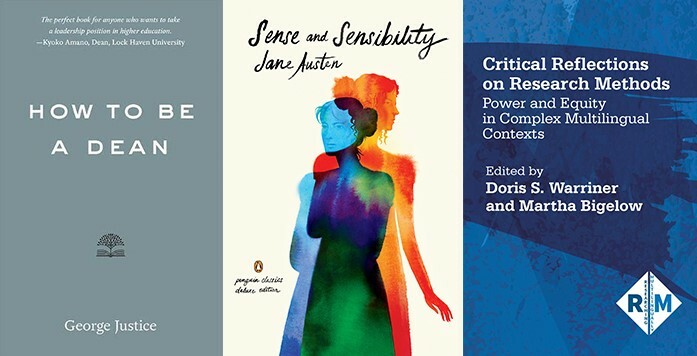 Three Department of English faculty members are celebrating the recent and/or imminent release of books. Volumes include a how-to for higher ed admins, a new edition of a timeless classic, and a collection of research reflections. Justice is professor of English in literature at ASU. He has served as dean of the humanities at Arizona State University and dean of the graduate school at the University of Missouri. Marianne Dashwood wears her heart on her sleeve, and when she falls in love with the dashing but unsuitable John Willoughby she ignores her sister Elinor’s warning that her impulsive behaviour leaves her open to gossip and innuendo. Meanwhile Elinor, always sensitive to social convention, is struggling to conceal her own romantic disappointment, even from those closest to her. Through their parallel experience of love – and its threatened loss – the sisters learn that sense must mix with sensibility if they are to find personal happiness in a society where status and money govern the rules of love. This edition includes an introduction, original essays, and suggestions for further exploration by Devoney Looser. Looser is Foundation Professor of English in literature at Arizona State University and the author of The Making of Jane Austen (Johns Hopkins University Press, 2017). Warriner is associate professor of English in writing, rhetorics and literacies at Arizona State University, where she also serves as associate chair of the Department of English.